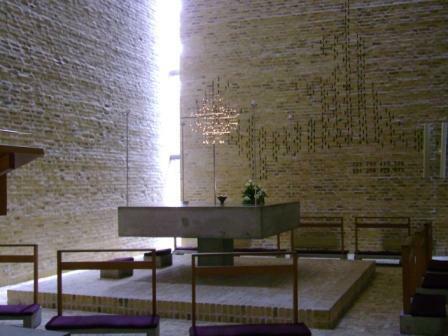 Inger and Johannes Exner and their architect firm have built a number of remarkable churches in Denmark, which make optimal use of the renewal in church building of the ’60’s following Vatican II. This Catholic ecclesiastical council had a lot of influence in the Danish Lutheran church. 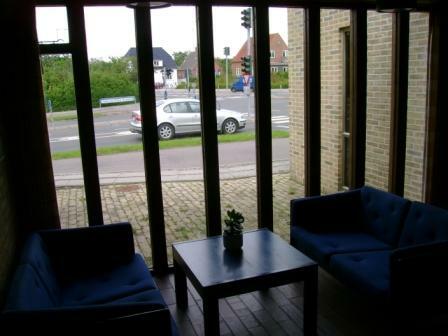 The exterior and interior design of churches became more community oriented. 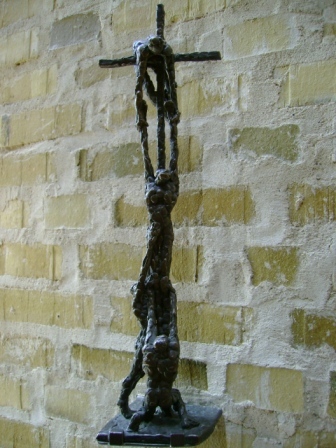 In the Nørrelandskirken in Holstebro this is combined with the presence of many paintings by visual artist Jens Nielsen (1891-1978), which are especially found in the church community centre. 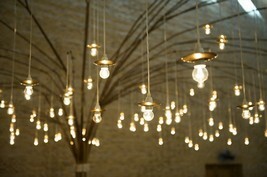 Beauty and artful design are present throughout the church complex, even in the special lighting, and yet it remains a thoroughly practical church centre. Architecture and visual art reinforce each other. The Exners have sought to incorporate the contrast as well as the relationship between church and society in their design. The Nørrelandskirken is situated at an intersection and shares a parking lot with a shopping centre, a school and a kindergarten. Upon arrival one is overwhelmed by the spectacular belfry which, only kept straight by a spiral staircase and a network of steel cables, moves in the wind. 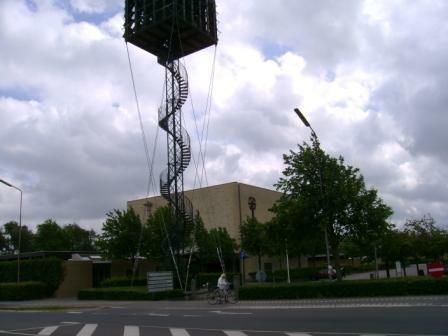 It makes clear that whoever wants to climb up to connect with the city by playing the bells, does so at the risk of one’s life – even or maybe especially when you take the wind as an image for the Spirit. 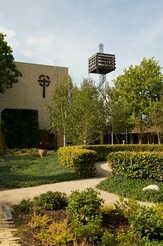 The cube of the belfry corresponds with the rectangular shape of the church. The roof of the inviting central entrance reminds one of water, a theme that is continued inside, as under this roof one finds the reception room for the baptismal parents. This room in turn overlooks the enclosed garden with in front a structure that in three stages carries water from the roof to the garden. 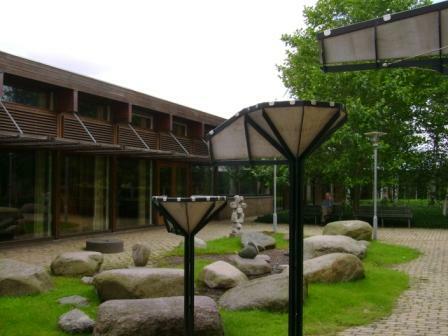 The church and church centre are situated around an enclosed garden, which lends the whole a cloister-like unity and makes the peacefulness of the garden radiate to the whole complex. The enclosed garden, dotted with sculptures, is a wonderful meeting place; in the back of the garden one can even discover a sheltered campfire place for the church youth. 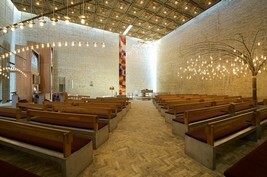 The church is situated to the right of the entry, a cube with almost only indirect light used to create an atmosphere of ‘calm and gravity’. The light and lamps are moreover present as meaningful elements: the light entering via the cracks in the corners contrasting with the darkness, the lamps on the altar forming a tree of life, a big standing structure of lamps in the middle of the church designating a tree of love. 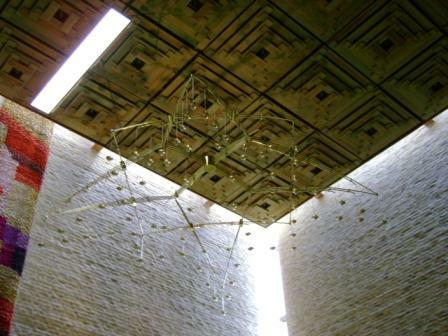 The lights in the ceiling represent a starry night, whose twinkle effect is reinforced by a complex of lamps in the form of a big star. Behind the altar a colourful carpet represents the ladder of Jacob – the warm colours of the carpet form a beautiful contrast with the light natural tones of stone and wood of the walls, the floor and the ceiling. Instead of an altar in the front of the church, it here is located in the centre. In this way the church community sits around the altar, facing each other and the central message. It is here that the influence of Vatican II is most strongly felt. One is also reminded of reformed church architecture in the Netherlands before WW II inspired by Abraham Kuyper, which accorded a central place to the pulpit. Only a few sculptures and a single painting are present in the church, small accents which do not force themselves upon the believers, but fill the space with their meaning. 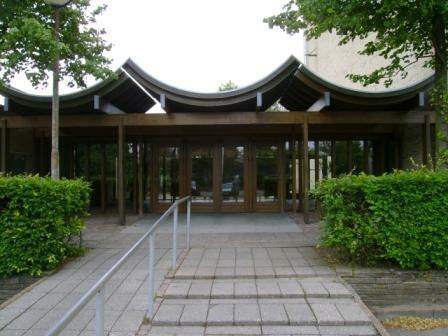 The church community centre around the garden separates the garden from the street, which is visible through the many windows in the corridor. 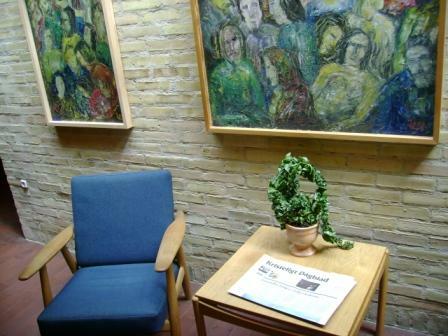 Throughout the corridor and in the various meeting rooms we find paintings by Danish artists, but especially by Jens Nielsen who for many years lived in Holstebro. 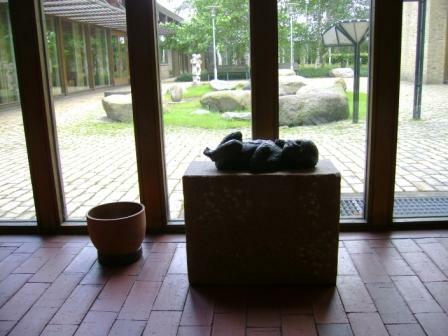 To the side of the church a museum is located, dedicated to his work and that of Olivia Holm-Møller. Walking through the garden one most strongly feels the connection between the church and the belfry. It reminds one of the significance of the church for society. Or maybe one should say: the significance of faith for creation.